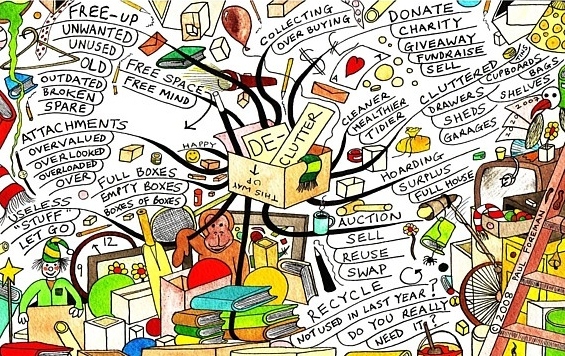 Clearing Out the Clutter – The Inner Soul of Me! Has Your Bottom Fallen Out Yet? A garage serves as “storage” for things that don’t have a place or space for in your home. Sadly, there are times when you are ashamed to open the door. You don’t want anyone to see the clutter you have accumulated. So, periodically, you set aside a workday to clean it up. Our hearts and minds are a lot like that—they accumulate lots of clutter. As we interact with the world, inevitably, perhaps unknowingly, we pick up ungodly thoughts and attitudes. We begin to think that life is all about “me.” Demanding “our” rights and reacting bitterly toward those who have hurt us. Before you know it, our hearts and minds are no longer clean and orderly; and while we think we can hide the mess, eventually it will show and come to light. 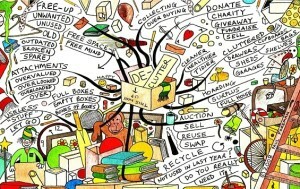 Perhaps it’s time to set aside a spiritual workday and, with His help, get to work clearing out the clutter. Discard those thoughts of bitterness and hatred. Bag up and throw out the old behaviors and possibly people. Organize your attitudes and fill your heart with the beauty of God’s Word. Make it clean to the core, so that you will be able to leave the door open instead of being hidden by the mess. Don’t let the Spirit reside in a cluttered heart because he cannot work in one. Make some time to clean it up today! A great reminder! Sometimes I feel that by relaxing and being loving as I clean my home, it does a great deal towards cleaning my inside mind as well. It’s a great reminder.